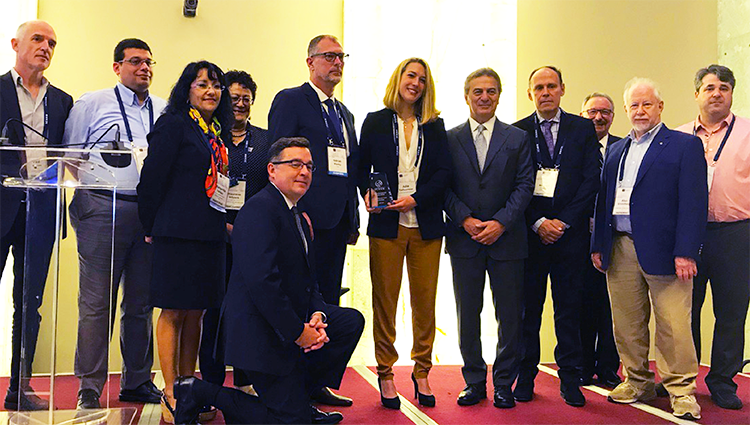 PANAMA CITY – 25 June 2018 – The Internet Corporation for Assigned Names and Numbers (ICANN) is honored to announce the recipient of the 2018 Multistakeholder Ethos Award. This year, the community selection panel posthumously recognized a long-time member of the ICANN community: Stéphane Van Gelder. The award was presented today at ICANN62 in Panama City to Stéphane Van Gelder’s wife Julie Talfournier Van Gelder. The Multistakeholder Ethos Award honors members of the ICANN community who have made outstanding contributions to ICANN’s multistakeholder model of Internet governance. Stéphane Van Gelder was selected from a list of 16 nominees as the person who best demonstrated the spirit of collaboration, strongly promoting consensus. The community selection panel composed of nine members from different Supporting Organizations and Advisory Committees recognized Van Gelder for his immense dedication and commitment to ICANN’s multistakeholder model, which served as an example to others in the community. The multistakeholder model is built on achieving consensus, and Van Gelder’s contributions epitomize this ideal, making him the perfect recipient for the 2018 Multistakeholder Ethos Award. A unique point that stood out from the beginning of the community selection panel’s process was that Stéphane Van Gelder received nominations or endorsements from at least 10 different community groups, and also from several individuals and community leaders. It was an unprecedented level of support and something that the selection committee immediately recognized as important. The breadth and depth of cross-community support spoke directly to his impact representing each of the award’s criteria – breaking down silos, working across multiple groups, engaging in a collegial manner, and a record of substantive and meaningful contribution over many years. Completion of an extensive update of the GNSO's operating procedures. Establishment of the Domain Name System Security (DNS) Security and Stability Analysis Working Group, working jointly with the At-Large Advisory Committee (ALAC), Country Code Names Supporting Organization (ccNSO), and Number Resource Organization (NRO). Completion of the Fast Flux, Post-Expiration Domain Name Recovery and Inter-Registrar Transfer Policy (IRTP) Part B Policy Development Processes (PDPs), and the joint ccNSO-GNSO Internationalized Domain Name Working Group. Launch of the IRTP Part C, Thick WHOIS, and Locking of Domain Names subject to Uniform Dispute Resolution Policy Proceedings PDPs. Completion of the Applicant Guidebook for the 2012 New Generic Top-Level Domain (gTLD) Program and the launch of the program. Van Gelder was also a long-time contributor to the ICANN Nominating Committee, beginning in 2013, serving as its chair in 2015 and associate chair in 2017. He was a well-respected and much appreciated member of not only the GNSO, but of the broader ICANN community. His genuine passion, energy, and commitment to ICANN’s mission and his achievements in various roles across the community were second to none. All of these qualities and accomplishments strongly support the selection of Stéphane Van Gelder as the recipient of ICANN’s 2018 Multistakeholder Ethos Award. At this time when we celebrate his contributions, ICANN also extends our deepest condolences to his family, friends, and colleagues. Launched in 2014 at ICANN50, the Multistakeholder Ethos Award recognizes ICANN participants who have invested in consensus-based solutions, acknowledged the importance of ICANN’s multistakeholder model of Internet governance, and contributed in a substantive way to the higher interests of ICANN’s organization and community.